Teleflora™ just updated its product catalog. Great you think? Fantastic new seasonal photos for my florist website, great new products for my customers? Well think again. Teleflora™ updated its product catalog and is now charging its member $399 each plus $14.99 per month for ongoing updates — total $580 next year for new cost. In addition, florists need to buy new containers, adding additional cost! If we assume conservatively that florists stock half of the 11 new containers, that they need to buy them by the dozen, and that the vases cost $3 above a plain vanilla container — that’s an additional $180 in container cost per florist over the next year, bringing the grand total to $760 Teleflora will charge the average member florist! So let’s do some quick math. Teleflora’s™ website says they have 18,000 florists. If the average florist pays $760 next year — that’s $13.6 million they will make next year alone from rolling out a product catalog! That’s $13.6 million dollars Teleflora™ will earn for work that cost them maybe $100,000! In retail terms, that’s a 13,600% markup on the company’s $100k investment — this is an insult to retail florists who have built Teleflora™’s business. In what other industry is it possible for providers to mark up their products more than 13,000%? This is Wikipedia’s description of a monopoly — sound familiar? In economics, a monopoly exists when a specific individual or an enterprise has sufficient control over a particular product or service to determine significantly the terms on which other individuals shall have access to it. Monopolies are thus characterised by a lack of economic competition for the good or service that they provide and a lack of viable substitute goods. The verb “monopolise” refers to the process by which a firm gains persistently greater market share than what is expected under perfect competition. In other words, this is yet another updated, refreshed version of Monopoly™: The Flower Shop Edition. And where is that $13.6 million going? Advertising Teleflora’s brand, not yours. Retail florists can take back control from the wire services. 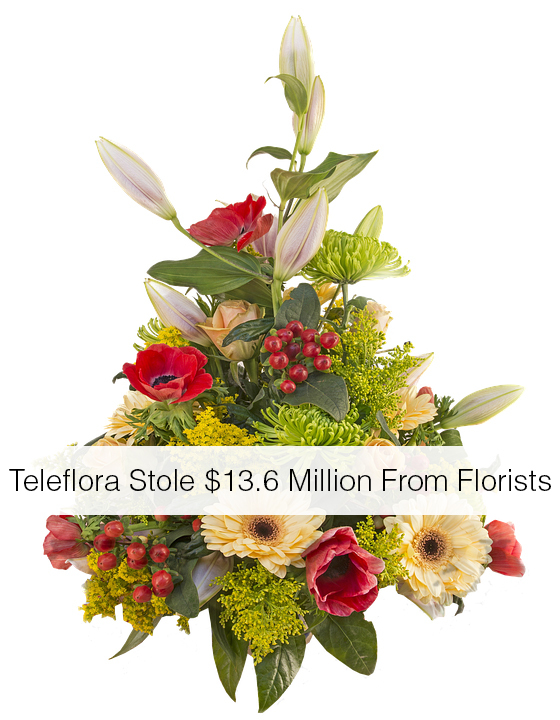 Call your Teleflora™ rep and tell him what you think about their monopoly behavior. And start thinking about independent ways to market your business without the wire services. I’m not personally using Teleflora — I’m an FTD affiliate — but I could just as easily see them doing this. I agree this is more monopoly behavior from the wire services. Good article.. No surprise.. They’re crooks!!! This is why it is best to just go through local florists! When we opened we were going to go with teleflora but changed our minds before anything got rolling and haven’t regretted it one day! it’s the big guy bully syndrome… why do they do it….? because we let them!!! I disagree with the article. I am a teleflora florist and have been for many years. They offer terrific products and services and my business has been build, in substantial part, b/c of Teleflora. Sure they make money, and they should. That’s why we are all in business. The new guide has allowed me to sell bigger and nicer arrangements, too, so I have already made up for the cost. I hope you publish this so readers can see the other side to the story. I think FTD charges a monthly fee for their directory. I wouldn’t be surprised if they charge for their next guide. We just dropped FTD, will be dropping Teleflora soon. No brainer, after deducting the wire service charges and the costs of the arrangement and delivery, the few dollars left over just isn’t worth it, I’m working to keep them in business while we bearly make it. Think I will stick with direct orders, at least I know I get to keep about 35% more than a wire in. Did you follow through with dropping TF? We are currently looking into doing so but the task seems daunting. If you wouldn’t mind, would you let me know how it all worked out? We as well are tired of them making more money off of our work and product that we are! I have just written my letter to cancel Teleflora membership. I am a new shop that opened 3 years ago-at the start of the economy declining. I have worked extremely hard and can no longer afford to put money in Teleflora’s pocket and not my own! The new quide was the icing on the cake. We offer gorgeous , reasonably priced designs and pride ourselves on personal relationships with customers-Teleflora negates all of those core values. It’s time to give customers the value and personal service they deserve and to reward the florists , not Teleflora. You forgot the extra payroll/taxes needed to fill the orders. Add that into the equation and you get even less. Those baster got in touch with my wife and scared her into paying for the stupid book. I told them to go to …..
By the way Jack Johnson he probably works for TF, it’s called the internet, how many customers come in and look at your books. Most are older who have a hearth attack when they see the prices of their cut and pasted pictures. Do you think they are pictures of actual arrangements, yea right get glasses. I would like to know where they pay their spray roses. I am a florist and was a member with Teleflora. This company charged me for an “ad” that I didnt authorize..charged me for zip codes I dont deliver to and tacked on additional fee’s that NOBODY could expain to me what they were for. In the end they demanded more than $3000 dollars or would ruin my credit. They are liars, theives and whores and I caution anyone reading this to run from this company or get SCREWED like I did. I have since heard many similar stories like mine. I have learned to research a company before doing business when them. Btw FTD is honorable and professional but I didnt get enough orders to justify membership but at least they didn’t STEAL from me. I have been in business since 1986. With today’s technology, we don’t need the wire companies. We do not make any $$$. We are only servicing the “order gatherers”. If we stop being members of all wire companies, we can slowly regain our customers and start making money. For 29 years I have been a wire member and it’s frightening to let go of any of them but when you finally do…..you direct your attention to your business, your customers, your creations. WE DO NOT NEED THE WIRE COMPANIES. We always have flower shop to flower shop orders!!! So so simple, but from talking to other florist, they feel that the order gathers would just open their own shops or outfit a local shop and pass their orders along to that shop. I tried to find a law firm to file a class action suite. I didn’t have any luck. I also feel shop local shops are favored over others, which allow them no worries. Plus now they are marketing to funeral homes, giving them custom web sites. Total rip-off, the funeral home gets a cut the order gather gets a cut, and the customer gets ripped off. We purchased our shop 2-1/2 years ago and we were legacy FTD and TF. I looked at the numbers from FTD and it was literally a break-even situation. We terminated our contract and suddenly we were the “mostimportantfloristintheworld”. Uh, bye-bye. TF is next. We run in circles to purchase product, make arrangements and deliveries, and at the end of the day, we get approx. 50% of the gross sale. Add in COGS and overhead, and the only people making money are the DOGS and TF. Just one example – why on Earth do I have to pay $1.75 ever time TF graces me with a received order? We’ve gotten wire down to 12-14% of our gross sales, so when we do give ’em the boot, we expect topline sales to drop, but the bottom line to increase because of reduced COGS and overhead.